The baroque garden of Ellingen Residence was first portrayed in 1726, in idealized form, in a picture from a calendar featuring the coats-of-arms of old aristocratic families. 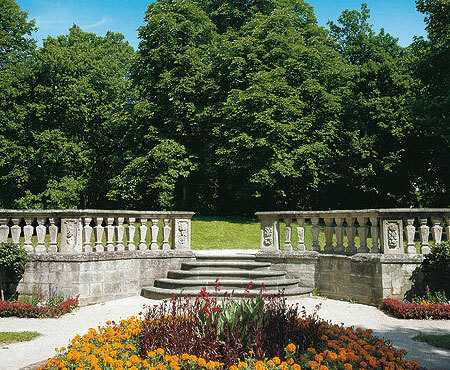 In the 19th century it was transformed into a landscape garden and one of the pavilions bordering the north side of the baroque palace garden was rebuilt in the neoclassical style. This was badly damaged in the Second World War and was removed in 1945. The only remaining architectural feature of the park is a balustrade. The park has beautiful old trees of many kinds, under which there is a carpet of bluebells (lat. scilla) in the spring.